FishFishFish Blog: Why use Seachem AquaVitro Salinity? AquaVitro Salinity is a blend of salts that has been specifically formulated for the reef aquarium. Containing all essential major, minor and trace components found in natural reef waters, Salinity contains no toxic or non-essential components. 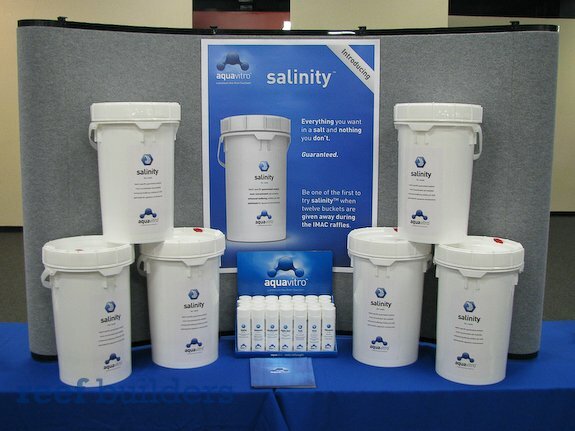 AquaVitro Salinity is the most concentrate salt blend currently available on the market. With a hydration level of <0.5% AquaVitro Salinity will yield a greater volume of prepared saltwater per unit of weight than any other salt mix. AquaVitro Salinity is identical to the distribution of anions and cations found in Natural SeaWater (NSW). Seachem have compiled data from all the oceans and seas on the Earth and have targeted the midpoint of the range for each element. Seachem guarantee to be within +/- 3% of the midpoint. Each batch of AquaVitro Salinity is tested and the results placed on each bucket made within that batch. So in summary – Seachem Aquavitro Salinity salt offers a fantastic top end natural seawater salt at a fantastic price.